Everything leaders do communicates—whether they want it to or not: How they spend their time, what they focus on, whom they interact with, the employees they recognize, and beyond. 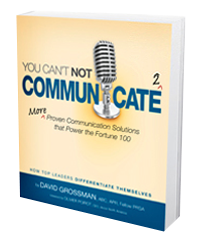 It was this realization that inspired David Grossman’s first book, You Can’t NOT Communicate: Proven Communication Solutions That Power the Fortune 100, and its follow up, You Can’t NOT Communicate 2. Now David is back with a new edition of the original You Can’t NOT Communicate that’s bigger and even better. 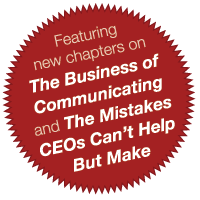 A new foreword by Jeff Stratton, Executive Vice President and Worldwide Chief Restaurant Officer of McDonald’s Corporation, focuses on the importance of good communication to everything McDonald’s does, from motivating employees to offering outstanding customer service. Expanded content explores the business of communicating and offers an in‑depth guide to strategic planning for CEOs. Everything you do and say communicates SOMETHING. So not communicating is not an option. In fact, the most effective leaders know that their success hinges on being leadercommunicators. 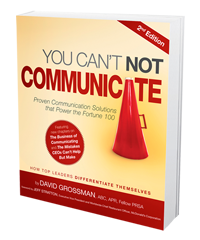 David Grossman, author and award‑winning leadership communication expert, has spent years asking his clients: "If you know that you are constantly communicating, don’t you want to do it effectively?" 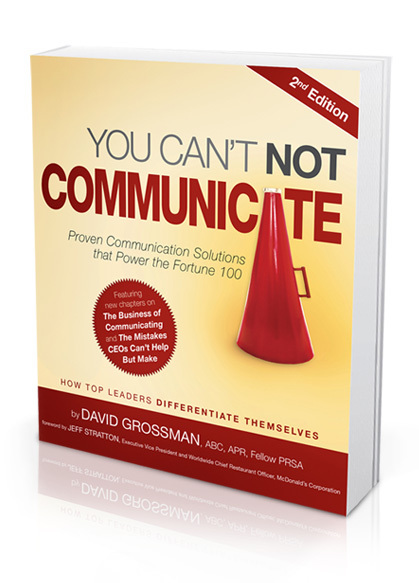 In You Can’t NOT Communicate: Proven Communication Solutions that Power the Fortune 100, David shares his road‑tested communication strategies—the same strategies that have helped leaders at some of the world’s best‑known companies find success and become leadercommunicators.